Imphal, October 22 2008: Coming out against the bomb blast strongly, various social organisations have termed the incident as barbaric and inhumane. Sharing the grief and sorrow of the bereaved families as well as the pain and agony of the families of the wounded victims, these social organisations have appealed to the individual/groups responsible for the attack to come out with an explanation. Condemning the bomb blast, United Committee Manipur (UCM) said the incident has yet again shown the inherent weakness and total failure of the Government in maintaining law and order. The State Government should take up necessary measures to ensure such violent incidents do not recur. Terming the bomb attack as an act of terrorism, All Manipur United Clubs' Organisation (AMUCO) categorically stated that whether it was perpetrated by non-State actors or State agencies, it could never be considered as a part of the ongoing armed conflict since the attack was targeted in a crowded place. In a statement, publicity an information secretary of United People's Front (UPF), Manipur N Rupachandra said triggering a powerful bomb blast in a crowded place is a barbaric act which defies all reasoning. Describing it as an act of cowardice, publicity secretary of MAFYF, General Council H Manimohan said it is the biggest misfortune of the already hard pressed people of Manipur that they are being subjected to such brutal attacks. Condemning the terror blast, All India Christian Council, All India Confederation of SC/ST Organisation and NE Support Centre & Helpline, in a joint statement, said that there should be no place for terror among civil society. Expressing shock over the bomb blast, Zeliangrong Union and Zeliangrong Youth Front of Assam, Manipur and Nagaland termed the explosion as barbaric and an act of terrorism which is against the law of the land. United NGOs Mission, Manipur, which is a network of 103 NGOs spread over all the nine districts of Manipur, said last night's bomb explosion which claimed lives of 16 innocent civilians and injured 32 civilians was a crime against humanity. 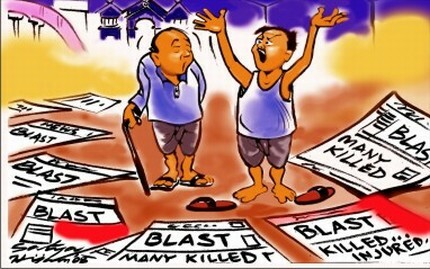 Describing the bomb blast in the crowded place as an act of terrorism, cowardly and the most heinous crime, All India Students' Federation (AISF), Manipur State Council said that the incident was a testimony of the complete failure of the Government in maintaining law and order in the State. Inpui (Kabui) Naga Union, Ragailong Pei (Court) and Ragailong Youth Club have also strongly condemned last night's terror strike near the gate of Ragailong village which has claimed atleast 16 lives and injured more than 30 people. Even as Ragailong Youth Club condoled the sad and untimely demise of Shangaulung Maringmei s/o late M Dihempou, who was one of the victims killed in the blast, Ragailong Pei has urged the Government to pay befitting ex-gratia to all the bereaved families of the blast victims. While condemning the bomb blast and sharing in the grief of the bereaved families and praying quick recovery of the injured, Centre for Organisation Research and Education (CORE) has appreciated the prompt response of Chief Minister O Ibobi Singh and other authorities concerned and urged the Government to implement the assurances given to the aggrieved families at the earliest possible. Demanding the Government to book those involved in the bomb blast and award befitting punishment in accordance to the law of the land, CORE has also appealed to all section of the people not to carry out any violent incidents in residential areas. Condoling death of Md Belal, an executive member of BJP Minority Morcha who was one of the victims killed in the last night bomb blast, party workers of BJP Manipur Pradesh observed two minutes silence during a condolence meeting held at State conference hall today. The condolence meeting was also attended by party vice president Dr S Dhananjoy Singh, general secretary Prof S Tiken and Minority Morcha president Md Rahamatullah. On the other hand, along with formation of a Joint Action Committee against the killing of Md Ayub Khan, a 17-year old ice-cream, who was one of the victims of the last night's bomb blast at Ragailong, the convenor of the JAC Md Abdul Quayum has announced that various agitations in association with other civil organisations in the State if the Government fails to book and punish those behind the bomb blast. National Identity Protection Committee (NIPCO), Threatened Indigenous People's Society (TIPS), Kanglei Apunba Ima Yaipha Lup, Students Federation of India (Manipur State Committee) and CPI (Marxist), Manipur State Committee have also strongly condemned the bomb blast decrying it as an act of terrorism which defies the existing International and humanitarian laws. They have also denounced the State Govt for its failure to protect the lives of the people. Condemning the bomb blast in a crowded public place, Manipur Pradesh Congress Committee has appealed to all concerned to ensure such violence incident do not recur in the future. It also shared in the grief of the bereaved families.